With Valentine’s Day just two weeks away, and in view of the popular association of chocolate with the celebration of this day, we decided to organize a taste test to determine the best truffles that France’s chocolatiers have to offer. We assembled a group of professionals in the culinary field to sample this confection in a blind taste test. When we compiled the scores that they awarded, some surprising results emerged. 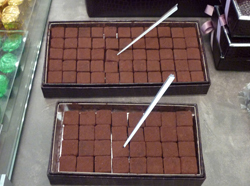 Read about the tasting in this month's Paris Insights.